Have just moved to a new property and require a cat flaps removed and to be replaced with a UPVC Door panels? Then call The Window Wizard. The removal of existing cat flap and installation of new UPVC door panels can be supplied and fitted in one trip. We carry stock of the different size panels and thicknesses. When removing a cat flap and replacing the existing UPVC door panels, rest assure we will only use top quality UPVC door panels. Self-extinguishing fire retardant materials and fulfils Part L Building Regulations. Likewise if you have a flat panel which has been damaged during a burglary? Or a double glazed glass sealed unit you would like replaced in your UPVC front door? Then we are happy to supply and fit the panel for you in one trip. We know how special your cats are to you, so if you would like us to fit your own new cat flap which you have purchased into your UPVC door, along with our reinforced panels we are happy to offer this service. 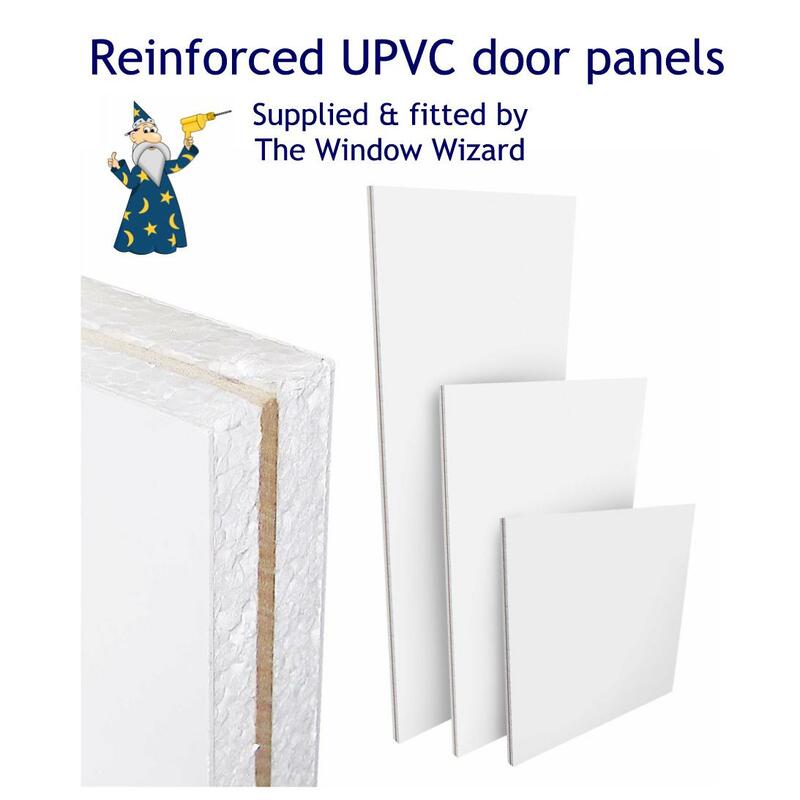 The benefit with this is that the customer can keep their old panel and if the cat flap is no longer required then your old panel can be refitted. We ensure that all Cat flap will be fitted in the best location for your cat and the homeowner too as we know that you want the best for your cat but at the same time the cat flap not to be an eyesore in your home. The best location to fit a cat flap would be in a single UPVC back door with a centre rail or French doors with a centre rail. 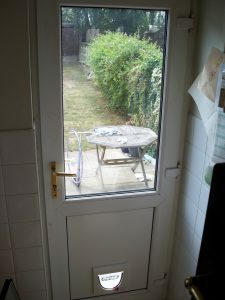 Alternately if you have a conservatory extension, you could place a cat flap in a lower panel. Please note that aluminium doors have a different thickness panel to UPVC doors. 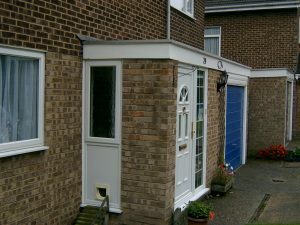 Therefore, depending on the style of your aluminium door, a reinforced panel may not be available. Cat flaps don’t necessarily need to be fitted into a door. Please see below a photograph of a cat flap fitted into a UPVC panel on the side of a front porch. Sorry we do not fit cat flaps into double glazed windows. As the complete glass sealed unit will need to be replaced. Double glazed units are sealed units. Therefore, if this seal is broken by cutting a hole for a cat flap, then air can enter and cause your window to steam or mist up. We cannot guarantee the seal unit as once the hole in the glass has been cut. Also newly sealed the glass becomes more prone to misting and condensation than a standard seal glass unit. Furthermore, please click HERE for our sitemap for a full list of our Double Glazed Repair services. I was asked by a new home owner if I could remove a cat flap and replace the UPVC panel in her front door as she didn’t have a cat. Please note that fitting a cat flap in a full length UPVC panel as shown in the photograph is not only unsightly, drafty, a security risk. An intruder can easily flick the inside handle through the cat flap, to open the door if it is not double locked. 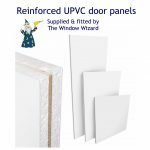 Most importantly the full length panel insert is not only a lot more expensive to replace than the standard flat half panel but a replacement may not be available. When it comes to home security, ensure that every night you double lock your doors. Place the keys far away from the doors so that they can’t be reached via a letter plate or cat flap. Put your door keys in a place everybody knows about. Most importantly somewhere accessible in case you need them to get out of the house in an emergency. Do not leave the key in your back door as a burglar could use a stick or pole through the cat flap to be able to turn the back door key in the lock and open the door. Don’t leave any keys in the door lock. Have inherited a cat flap from the previous owners and you don’t have a cat yourself? I would suggest removing the cat flap and replace the panel with a new reinforced panel. Select a cat flap with a lock however, this is designed to keep other cats out, not burglars. A high percentage of cat flap burglaries happen because the key has been left in the door. Some customers use dog flaps if they have large cats therefore, if a child can fit through the flap. This could be a security risk and one you may not be covered by your insurance. It has been known that certain adults take children with them ‘on a burglaries’ for the sole purpose to steal or find the keys to unlock the doors. Please click here for more information about our door lock repair service. While cutting my grass a stone flew off my lawnmower and shattered my Double Glazing Glass Unit. Can I replace it with a Door Panel? Gardeners beware of stones flying off your lawnmowers or strimmer and smashing your glass unit. Small stones can fly out of the lawnmower or grass trimmer and hit the glass. However, the door glass should always be toughened glass. Therefore when it smashes, the glass will craze and fall into tiny pieces. Unlike float glass in windows, which can be deadly as it tends to break into large sharp pieces. 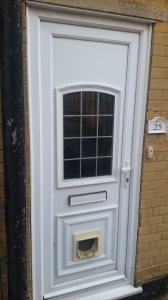 We can replace the lower level glass in a double glazed window or door with a UPVC half door panel. We can replace your conservatory lower panels with a solid reinforced UPVC flat door panel. So next time a stone chip goes flying when cutting the lawn your UPVC panel will not shatter. Costing you a fortune to repair, especially if it is a toughed glass unit as found in all double glazed doors. Patterned or textured glass tends to be more fragile than smooth clear glass because of the pattern weakening the glass. 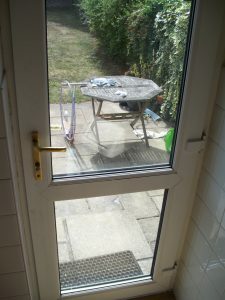 The removal of existing cat flap and installation of new UPVC door panels can be supplied and fitted in one trip. We carry stock of the different size panels and thickness.